One of our couple friend got too many herring by mistake and they are off for Easter holiday, so they gave us five herrings. So I have to cook something with the herrings during this Easter holiday. 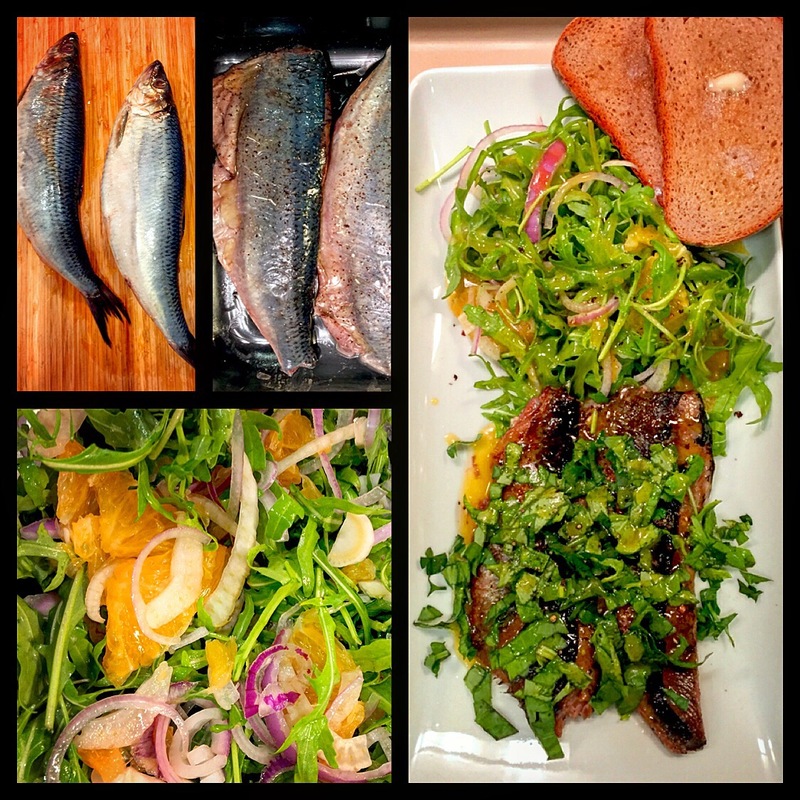 That’s what I came up with, grilled herring with orange, fennel and arugula salad. Let’s get the herring clean and get the filet out from the whole fish. Chop the head and tail off, then cut the fish open and get all the inner parts out, then cut from the bone and slide the filet off. Well, actually there are still a lot of bones, it is so tough to clean up all the tiny little bones. Pre-heat the oven and meantime can get the salad ready. Cut the fennel bulb into thin slices, place them into a big salad bowl. Then, cut half of a red onion into thin slices, place them into the bowl as well. Then, remove the skin from two oranges, and then cut them into regular slices. Lastly, put arugula into the salad bowl, mix everything well together. Now, get the dressing ready, this dressing can be used for both the salad and the fish. The dressing will be with olive oil, mustard, honey, a bit of salt and lemon juice. When the oven is ready, switch to 210C and place all herring filet in a tray, no need to season with salt because the herring is quite salty. Just season with pepper and olive oil. Grill them in the oven for 10 minutes or until they are done. Squeeze some lemon juice on top, and garnish them with chopped basil and parsley. Serve the fish together with the salad and some bread.